Hilomast’s custom-made mast covers are an accessory that can be used against dust, dirt, rain, and other elements when your mast is not in use. 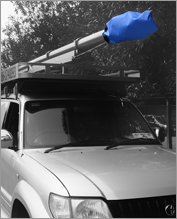 Hilomast’s custom-made mast covers are made of strong, waterproof material. The Hilomast mast covers are made to fit over mast collars and are secured to your mast by means of a strap. Hilomast mast covers are available as an end cover or a full mast cover. Every mast in Hilomast’s full range of masts has a specific and available mast cover. Please contact our Hilomast Sales team, by using the “Contact” page of this website or by calling (386) 668-6784, for more information on a suitable mast cover for your mast.